The famous Las Vegas Convention Center has plans for expansion, thanks to Atlanta-based architecture and interior design firm, tvsdesign. The already-enormous building’s Board of Directors has approved tvsdesign to spearhead the $860 million addition. Once renovations are completed, the exhibition hall will be North America’s second-largest, after Chicago’s McCormick Place. While the expansion is a large undertaking, the megaproject will proceed in phases. The LVCC District Expansion, shown below, is expected to be completed by 2020. 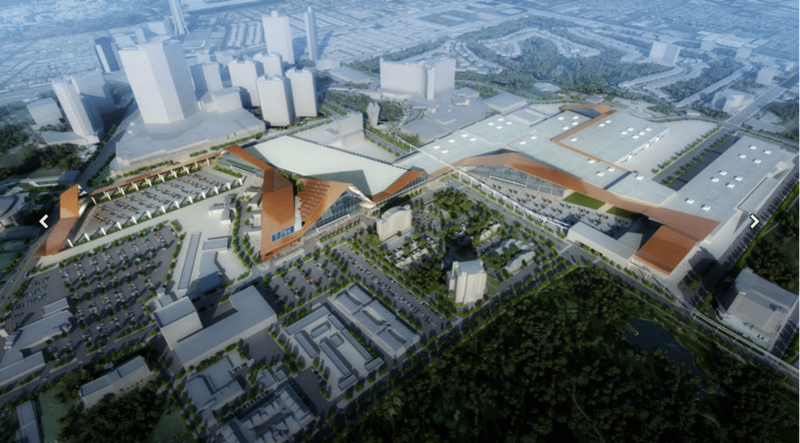 Subsequent renovations of the 3.2-million-square-foot trade show convention center will wrap in 2023. What gets us out of bed in the morning is doing big, complex projects that are important and have a meaningful impact on people’s lives. The Las Vegas Convention Center expansion is just that: big, intricate and positioned to deliver a positive impact on many lives. We are thrilled about the opportunity to create an iconic design for the world’s greatest convention city. We consider Las Vegas to be our second home, which isn’t surprising considering Gilbert has participated in about 300 shows at LVCC over the past 32 years as a custom exhibit company. This expansion is just one of many for exhibition halls across the United States – including the Jacob K. Javitz Center’s upcoming $1.5 billion expansion… right in our backyard! This trend is a good indicator of how the trade show industry is growing and thriving. We look forward to this major enhancement to the LVCC.